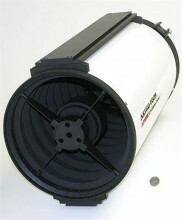 Developed by Astro-Tech to make large-format CCD imaging affordable for the amateur astronomer, the Astro-Tech AT10RC. Even better, despite its low price, the Astro-Tech-developed AT10RC has many of the same premium features as the high-priced competitive RCs – quartz mirrors, dielectric mirror coatings, and more. The affordable Astro-Tech AT10RC joins two other Astro-Tech Ritchey-Chrétien firsts. One is the AT8RC, also a Sky & Telescope Hot Product for 2010 – thefirst 8" true Ritchey-Chrétien astrograph available from a U. S. company and the first and still the only affordable U. S. 8" R-C with Astro-Tech-designed premium features like quartz mirrors, dielectric mirror coatings, two dovetail mounting rails, and more. The other is the AT6RC – a highly affordable R-C astrograph for DSI and DSLR imaging that was conceived and developed by, and first brought to market by, Astro-Tech and named a Hot Product for 2009. Both the AT6RC and the AT8RC were highly praised in a four-page review in the December 2009 issue of Sky & Telescope magazine. And we are serious when we say the 10" aperture AT10RC is “affordable." The Astro-Tech AT10RC is priced nearly $4000 less than the formerly least-expensive 10" R-C. As Sky & Telescope pointed out in their Hot Product citation in the January 2010 Sky & Telescope, “Ritchey-Chrétien reflectors are highly regarded among today's elite astrophotographers, and premium instruments often carry price tags starting at about $1,000 per inch of aperture. So it's the best kind of "sticker shock" to see the prices for Astro-Tech's 8- and 10-inch f/8 Ritchey-Chrétiens, which pack features too numerous to list here. Our review of the 8-inch scope appears in last month's issue (December 2009), page 38, and our initial hands-on look at the 10-inch suggests that it will be equally exciting for deep sky astrophotographers." The magazine also pointed out that the AT10RC cost “about one-fourth what similar instruments did just a couple of years ago." The Ritchey-Chrétien optical design is used in virtually every recent large mega-million dollar professional observatory telescope – including the Hubble Space Telescope The Astro-Tech AT10RC astrograph (a telescope designed specifically for photographing comparatively wide areas of the sky) makes the coma-free imaging of true Ritchey-Chrétien imaging optics available to the DSLR and large format CCD astrophotographer at a price less than that of many large format CCD cameras. Featuring first-quality 99% reflectivity dielectric mirror coatings and premium low thermal expansion quartz mirrors, this economical 10" Astro-Tech R-C makes you wonder just what competitive high-price R-Cs have that makes them cost so much more. Designed for exceptional imaging, the Astro-Tech AT10RC provides the wide coma-free photographic field that large format CCD astrophotographers crave, but can’t get from conventional reflectors and Schmidt-Cassegrains. Likewise, as a pure two-mirror system, the AT10RC is totally free from the spurious color that affects the imaging of all but the most costly apochromatic refractors, and it does it with an 10" aperture that dwarfs the light gathering of most apo refractors. The AT10RC photos of the Eagle and Trifid Nebulas in the “images of some features" section below are from AT10RC prototype owner John O’Neill. They were taken with an SBIG ST-10XME CCD camera and Astrodon filters. John had this to say about the AT10RC, “Finally got a full data image of an old favorite, The Trifid Nebula. Total of 1.5 hours of data on a 7 out of 10 night here in Florida. The scope is truly everything I expected and more. This shot was compared to one taken with a 24" RC (taken the same night) and you would be hard pressed to tell the difference. The guy that had the 24" was actually a little miffed that a $3,000 scope could do as well as his $75,000 scope :>)"
Another good example of why that high-end 24" R-C owner might be miffed is Brian Kimball’s exceptional image of NGC2244 also shown below in the “images of some features" section. This open cluster of young stars is nestled within the Rosette Nebula, and was recently formed from that nebula’s material. Brian’s image easily stands up to a side by side comparison with photos taken by professional observatories using much larger and more expensive telescopes, as well as to those taken with the most expensive amateur astrographs. If serious astrophotography is your goal, but the price of most true Ritchey-Chrétien optics has been keeping you from the optical design most modern professional observatories and the Hubble Space Telescope use for their imaging, your wait is over. The 10" S & T Hot Product for 2010 Astro-Tech AT10RC astrograph can bring the world of professional DSLR/CCD deep space imaging to your backyard observatory at a truly affordable price. Features of this Astro-Tech AT10RC Astrograph . . .
Hyperboloid primary mirror: Made of low thermal expansion quartz, rather than the Pyrex used by competitors. Ground and polished under precision computer control. Unlike catadioptric designs (SCTs, Maksutovs, etc.) that move the primary mirror fore and aft in the optical tube to focus (which can lead to image shift as the mirror position changes) the AT10RC primary mirror is fixed to eliminate both a catadioptric’s image shift and the frequent primary mirror collimation requirements of a Newtonian reflector. Hyperboloid secondary mirror: Made of low thermal expansion quartz, rather than the Pyrex used by competitors. Ground and polished under precision computer control. Mounted in a four-vane spider and fully collimatable using simple standard Cassegrain reflector collimating techniques. Unlike complicated R-C designs that use motors to move the secondary mirror fore and aft to focus, the AT10RC secondary mirror is fixed and focusing is done externally. 99% reflectivity dielectric coated optics: Both primary and secondary mirrors have non-tarnishing state-of-the-art multi-layer dielectric mirror coatings. These have a full 99% reflectivity for the brightest possible images. This is higher than the unspecified reflectivity (but typically 94-96% reflectivity) of the enhanced aluminum coatings used by competitors. Rolled steel optical tube: The optical tube is made of thin rolled steel for strength, with die-cast and machined front and rear cells. In addition to its strength, the thermal expansion characteristics of steel are quite low, much closer to carbon fiber than to aluminum. In most environments, this results in fewer focus changes due to the optical tube contracting as the temperature drops during an imaging session than you need with an aluminum body scope. For areas where extreme temperature swings are the norm, a very low thermal expansion carbon fiber body version of the AT10RC (the AT10RCF) is available to still further lessen the need for adjusting the focus over the course of an imaging session. Multiple internal light baffles: Computer optimized primary and secondary baffling. Nine contrast-enhancing glare-stop knife-edge baffles in the optical tube; multiple glare-stop microbaffles in the secondary mirror light shield; and baffles in the primary mirror baffle tube to provide truly dark sky backgrounds during imaging. Dual-speed 3.3" linear bearing Crayford focuser: A newly-designed extra-sturdy “linear bearing" Crayford focuser is threaded onto the rear cell of the AT10RC. A locking collar allows the entire precision-made non-vignetting focuser to be rotated to the most convenient imaging angle and locked in place. There is 140mm (5.5") of back focus available with the focuser installed (235mm from the rear cell of the scope, without focuser, to the focal plane). The focuser has dual-speed focusing. There are two coarse focusing knobs. The right knob also has a smaller concentric knob with a 10:1 reduction gear microfine focusing ratio. This provides exceptionally precise image control during critical imaging. All focus knobs are ribbed, so they are easy to operate, even while wearing gloves or mittens in cold weather. A lock knob underneath the focuser lets you adjust the tension on the drawtube to accommodate varying equipment loads. A large lock knob on top of the focuser lets you lock in your photographic focus. The new linear bearing focuser has a polished stainless steel drive rail that runs the length of the underside of the drawtube. The focuser’s stainless steel drive shaft presses on this drive rail to move the focuser, rather than having the hard steel drive shaft press directly on (and wear out) the softer aluminum drawtube as with conventional Crayford focusers. The steel drive rail rides in a self-lubricating track that extends almost the entire length of the focuser body. The drive rail and its attached drawtube are thereby supported over most of their length at all times, rather than by a conventional Crayford focuser’s two sets of small contact area roller bearings. This system distributes the drive force evenly over the entire drawtube, without concentrating it on a few small contact points. The result is a very rigid drawtube with essentially zero flexure and no wear (much less flat spots or uneven wear) on the focuser drawtube. To fine-tune the long back focus of the AT10RC to the requirements of your camera and equipment train, three threaded extension rings (two 1" in length and one 2") are provided to install singly or in combination between the AT10RC rear cell and the focuser. These provide a flex-free solid metal extension that changes the distance between the focuser and the rear cell. This lets you accommodate the varying back-focus requirements of DSLR-type camera imaging versus long equipment train CCD imaging. The two 6.4 ounce 1" extension rings and the 14.4 ounce 2" ring add 1.7 pounds to the weight of the scope when all rings are installed. For even more impressive coma-free imaging with the AT8RC, consider adding the Astro-Tech AT2FF field flattener. While not specifically designed to work with Ritchey-Chrétien astrographs, images taken with the field flattener by Astro-Tech R-C owners have shown that the Astro-Tech 2" field flattener works remarkably well with these advanced coma-free reflectors as well as with refractors. This modestly-priced imaging accessory essentially eliminates the residual field curvature inherent in all reflector telescope designs, so that the coma-free star images remain point-like all across the field. An optical analysis and ray tracing of the field flattener was done in ZEMAX and applied to the R-Cs by Roger Ceragioli, the noted optical designer who did the final optimization of the Astro-Tech Ritchey-Chrétien optics. Here is what he had to say about the #AT2FF, “My conclusion, which seems supported by what users are saying, is that you don't need any other field flattener. This one performs well over a 40mm image circle in all three small RCs (6", 8", and 10")." Because of the 34.4 pound weight of the AT10RC (36.1 pounds with all extension rings in place) , plus the weight of your ancillary camera equipment and any photoguide scope, installing the AT10RC on a German equatorial mount with a 60 to 100 pound payload capacity is recommended. Such mounts include the 90 pound capacity Celestron CGE Pro and the Losmandy 60 pound capacity G11 or G11 go-to and 100 pound capacity Losmandy HGM Titan. Other suitable mounts are also available. Focusing scale: The focuser’s 50mm (1.97") travel drawtube has scales marked in both 1/16th inch and 1mm increments so you can note individual focuser positions for easy return to the approximate correct focus when switching between varying photographic equipment combinations. Cooling fans: To allow the AT10RC to reach ambient temperatures more quickly for optimum imaging performance, there are three small low vibration/high CFM primary mirror cooling fans built into the rear cell. The high speed DC fans are powered by a standard equipment battery pack that plugs into a jack on the rear cell. The battery pack uses eight user-supplied AA batteries. An optional external DC power supply, such as a rechargeable 12VDC battery pack can also be used to power the fans. 1.25" and 2" compression ring accessory holders: The 3.25" o.d. focuser drawtube ends in a stepdown to a 2" accessory holder that uses a non-marring soft brass compression ring to hold 2" imaging accessories in place. The compression ring won’t scratch the barrel of your accessories as an ordinary thumbscrew can. Two thumbscrews are provided to lock the compression ring on your accessories. Also supplied is a 1.25" accessory holder that slips into the 2" compression ring holder to let you use 1.25" imaging accessories. Like the 2" accessory holder on the drawtube, the 1.25" adapter also uses a non-marring soft brass compression ring. Two dovetail mounting rails: Two Losmandy-style “D-plate" dovetail rails are provided for installing the AT10RC on an equatorial mount, as well as for mounting optional accessories (such as rings for a photoguide scope) on top. The 21" long dovetail rails run the length of the optical tube. One is mounted underneath the tube for installing the 34.4 pound AT10RC directly on a suitable payload capacity Losmandy-style equatorial mount. The second dovetail rail is mounted 180° away from the first, on top of the tube. This can be used for installing a photoguide ring set, piggyback camera adapter, or any other accessory that attaches to a scope by means of Losmandy-style “D-plate" dovetail adapters. The undersides of the dovetails have been hollowed out to lighten their weight without compromising their strength, as can be seen in the side-view feature image below. Finderscope dovetail: a Vixen-style finderscope bracket dovetail base is installed on the upper left side of the optical tube. It can easily be removed if not needed. It will accept Vixen-style finderscope brackets as well as red dot-type finders, such as the Astro-Tech #ATF. Two year warranty: As an expression of the confidence Astronomy Technologies has in the quality of their products, the Astro-Tech AT10RC is protected by a two-year limited warranty against flaws in materials and workmanship. Click the button below to add the Astro-Tech 10" f/8 Ritchey-Chrétien Astrograph to your wish list.